For Pat (Kember) Clement, the mere mention of Wittenoom causes a lot of personal anguish. This is not surprising, since this infamous blue asbestos mining town in the north of Western Australia has proved to be directly responsible for the death of every member of her immediate family. 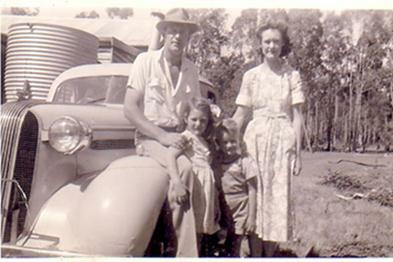 Pat was around 9 years old when her father, Vic, obtained work at the blue asbestos mine in Wittenoom and moved his wife, Dorrie, Pat and her brother, Brian, into one of the asbestos houses provided by the mining company. The Kember family did not stay in Wittenoom for long, but it was long enough for asbestos to take its deadly toll. More than 50 years have passed since the family left the fateful town. During this time, Pat has witnessed the suffering and eventual death of both of her parents and her brother to asbestos- related diseases — her father and brother to mesothelioma and her mother to asbestos-related lung cancer. Pat has generously agreed to talk to us about her memories of Wittenoom, her grief over losing every member of her family and her ever-present fear of developing mesothelioma or another asbestos-related disease. So many years have passed since I lived in Wittenoom, I can’t remember a great deal about the town. I do recall that our house was made of asbestos and that the backyard was very sparse with no lawn. The front yard was sparse as well, consisting mainly of a driveway which had a grey topping. I now believe that this would have been asbestos tailings. I feel ill when I think about how many times my brother and I used to pick up clumps of these tailings and rub them together to separate the fibers. It was so hot in Wittenoom, we often used to go to one of the creeks close by and paddle in the water to keep cool. On one occasion, when our cousin Beth was visiting, she and Brian spent a lot of time running up and down the piles of dirt around the area — which most likely contained asbestos. There was not a lot to do around the town, but I do remember going to the co-op and bringing back the groceries in the basket of my bike. Mum seemed to be always doing the washing. Dad used to come home covered in dust, and I remember her shaking the dust out of his work clothes before putting them into the washing machine. Knowing what I do now, the dust on the clothes would have been asbestos dust. After we left Wittenoom to live in Port Headland, there were many occasions when we returned to Wittenoom for school sports. I clearly remember that the same topping that was on our driveway was also around the sports oval. Thinking back, there were so many places where anyone in the town was exposed to asbestos. I even remember going on a school excursion to the asbestos mine. When my father became ill, I didn’t know that it was asbestos related. Dad was a very private man and used to keep a lot of things to himself. He did tell me that he was short of breath and that there was fluid on his lungs. At the time, I thought that he might have had pleurisy. I remember him going to the hospital to have the fluid drained and thinking that he would be OK after that. His breathlessness did go away for a little while, but he never seemed really well after that. He passed away a few months later. I was still grieving his death when my mother was diagnosed with advanced lung cancer. I cared for her until she died four months later. It was not until my brother, Brian, was diagnosed with pleural mesothelioma that I learned about this horrible disease and discovered that this is what my father had died of. I now believe that Mum’s lung cancer was also caused by her exposure to asbestos. Brian survived for two years after he was diagnosed. Losing him was devastating. We had always been exceptionally close, and his death intensified my grief over losing both of my parents to asbestos-related diseases. I am really angry that my family has been taken from me. I remember reading about a doctor who warned people about the danger of asbestos as far back as 1948. If they knew about the danger then, why wasn’t the mine closed? I know of at least two families who were in Wittenoom at the same time as me, who have lost a family member to asbestos-related disease. When the town of Wittenoom was finally shut down, I thought, “It’s too late for my family and so many others,” but it was something that had to be done. Losing my family has been a painful way to learn that asbestos kills. I now worry about my husband, Noel, who has retired but was a carpenter for many years. He cut into a lot of asbestos sheeting during that time. Since losing my family, I live in constant fear about my own health. The Asbestos Diseases Society knows of my family history, and I have been having medical checks and X-rays on a regular basis. To date, all of my tests have been clear. I have, however, recently suffered from breast cancer, which I don’t believe was caused by asbestos. Not long after my recovery from breast cancer, I started to feel really breathless. My doctor put me through some tests and later informed me that my breathing capacity was only 30 percent. Shocked by this news, I became convinced that I was going to die of mesothelioma or some other type of asbestos disease like the rest of my family. I have never been so frightened in my life. Thankfully, I was wrong. My shortness of breath turned out to be due to the radiation treatment I had undergone when I had breast cancer, and there was some scar tissue adhered to my trachea which was causing a partial blockage. I have since had a dilation procedure to alleviate this, and my breathing has much improved. I am not sure how long this will last and might have to have another procedure done in the future. When it comes to tragedy, Pat has had more than her fair share. Last year, her beloved daughter, Ann, passed away from brain cancer. Pat had been her devoted caregiver for five years. 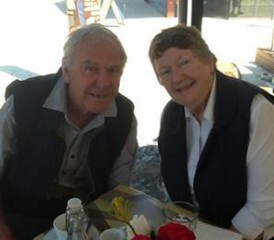 A survivor of prostate cancer, Pat’s husband, Noel, now sufferers from Parkinson’s disease. It is hard to believe that so much grief could be placed on one family, yet despite this, Pat has not lost her spirit, and she is the first one to come forward when someone needs a helping hand. Devoted to her husband, Noel, her son, Dave, and his wife, Chris, Pat is the proud grandmother of six grandchildren, who keep her pretty busy as well as bringing her much joy. Have you lost someone you loved to an asbestos-related disease? You can leave a comment below or share your story on our Facebook page.